As you know, I’ve really been working on my photography skills lately, and I need all the help I can get. When it comes to taking pictures of products for review, I definitely need a steadier hand. I also needed something that would allow me to keep my camera around my neck without having it get all banged up. It was getting a little tiring to keep taking it in and out of my pocket. Enter the Gary Fong Flip Cage. The Flip Cage is a simple, lightweight device that adds stability to your photography while using it as a stand, and helps protect it during travel when flipped around to embrace the camera. It’s so simple to use, even my 6-year-old figured it out! Okay, actually, Jake figured it out before I did because I was trying to make it far more complicated than it was. Then he came a long and said “mom, screw this into that hole on the bottom of your camera!” Well, I got that part, but I didn’t realize you could move the screw back and forth depending on where you wanted your camera to rest. Yes, my kid is already smarter than me when it comes to things like spatial recognition. I’ve learned to accept it. You can flip the Flip Cage in so many different ways to achieve different effects. Use the attached opaque flares to prevent sun from saturating your videos, flip the camera face-down to take close-ups of jewelry and other goods, or put it on its side to take vertical photos. I couldn’t take my own pictures of the Flip Cage in action because I only have one camera (my phone takes cruddy pictures, and I have yet to figure out how to get them into the computer anyway). So check out this video for a better idea of what I’m talking about. 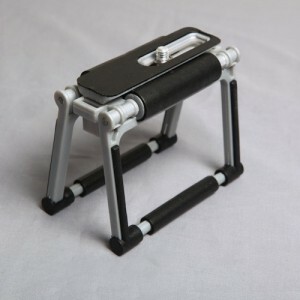 Gary Fong Inc.’s Tripod Adapter enables iPhone 4/4S and iPhone 3GS users to maximize their mobile device’s photographic capabilities. The Gary Fong iPhone adapter affixes to most tripods as well as the popular Gary Fong Flip-Cage lineup of camera stands, enabling both casual and pro shooters to steady their iPhones and produce crisp images and video in a wide variety of lighting situations. The Turning Leaves Giveaway is already underway, so be sure to enter!